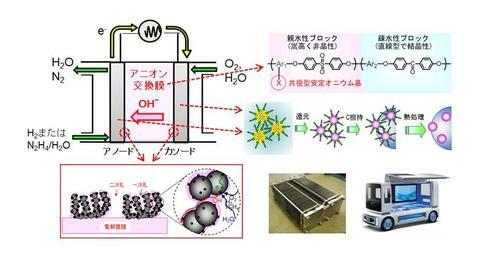 For high performance and durable alkaline fuel cells, the following research subjects are conducted: 1) stable anion conductive polymers, 2) high performance non-precious metal electrocatalysts, and 3) triple-phase-boundary with controlled reaction field. Conjugated anion conductive polymers and non-precious metal electrocatalysts (prepared by nanocapsule method) are combined to form electrocatalyst layers, of which structure is optimized to achieve efficient fuel oxidation and oxygen reduction reactions. The optimized electrocatalyst layers and the anion conductive membranes are used for improving the performance and durability of alkaline fuel cells.